Doctors had declared that he would never walk. But even as a child, Koushik Bhattacharya knew otherwise. He did not understand why his parents were depressed. Their only son had been diagnosed with polio as a ten-month-old and they had braced themselves for life-sapping difficulties. But what the eminent musicians of the Andul Kali Kirtan gharana did not realise was that their child was curing himself with what Bhattacharya—a 45-year-old classical musician who uses ragas to treat psychological diseases—himself now calls the “healing power of songs”. Not that he wasn’t ever demoralised. The sight of other boys playing sports did produce its share of sadness, but all that would disappear when he heard his father, Pandit Pat­aki Bhattacharya and mother, Roma Bhattacharya do riyaaz. “I felt intense happiness when they practised music and I started to realise that the positive energy this generated was having a direct impact on me physically,” Bhattacharya, now 43, recalls. “It made me feel elevated, as though I could do anything; it inspired me to try activities I was not supposed to be able to do. Regular riyaaz gave me so much mental strength and physical stamina, I began to gradually walk, run, jump, even climb stairs.” Today, he not only swims and does yoga, but drives to schools where he teaches music therapy—in South Calcutta’s Dover Lane and Bhawanipur, nearly 40 kms back and forth from his house in Andul, a suburb. Raag Lalit is effective for those suffering from extreme apathy; Hansadhwani evokes joy; the early morning Bhairav has soothed many a frayed nerve; Darbari fights insomnia. It is a sunny morning in the bylanes of Andul’s Dakshin Para neighbourhood, where stands the house where Bhattacharya had started his therapy initially as an experiment with a few pupils. “There were students who just wanted to learn music, but there were patients of depression too,” he says. During his training, first under his mother, then his father and eventually under the guidance of his gurus, Pandit Arun Bhaduri and Pandit K.G. Ginde at the Sangeet Research Academy in Calcutta, Bhattacharya had started to observe how different ragas evoked different emotions. “I noticed that the way notes were arranged in specific ragas, when rendered, triggered a vast range of visual imagery. Depending on the raga, I would experience the joy associated with visualising a burst of colourful flowers or running along a large meadow,” says Bhattacharya. At that time, he had consulted psychologists to try and understand how music stimulated various regions of the brain. Unsurprisingly, there was indeed a link between music and mood. “It is universally known that in Indian music, different ragas correspond to different times of the day,” he continues. “It occurred to me that the arrangement of notes in ragas is highly effective in conjuring up the day, with its myriad shifts in everything from light to sound and recreating conditions in the mind and senses that correspond to that moment. It seemed logical that I could evoke the sensations associated with the different times of the day—for instance, the calmness of dawn or the peacefulness of night—using permutations and combinations of the notes in the ragas. And I surmised that I could induce these feelings in those who suffered from their lack,” says Bhattacharya. As days went by, Bhattacharya started treating a host of psychological disorders, often ending in depression, using raga therapy. While he issues a caveat that patients of serious mental illnes­ses ought not to give up their regular treatments for music therapy, at least not without the consent of their psychiatrists or doctors, he does guarantee that music therapy would mitigate mental troubles, even acute symptoms, in the least, and nothing short of a full recovery them at the most. No wonder, his classes on any given day—between 6 pm and 9 pm on Mondays and Wednesdays in Calcutta and on Saturday evenings in Andul—are bursting at the seams, with students of every age “crowding around our beloved Guruji to imbibe his magical music,” as Chaitali Das, a homemaker and one of his students, phrased it. She had initially gone to admit her daughter to his music classes after she complained of excessive stress during examinations. “After a few sessions her remarkable improvement prompted my husband to suggest I too get enrolled. I had been suffering from extreme depression, but now I am a completely changed person. Guruji’s meditation and music techniques have recharged my life”. Likewise, Shyamal Bhattacharya, a professor, did not just fight retirement blues through music therapy, but claims that he is so completely cured of many of his physiological conditions, including hypertension, that he never skips a session. The success of Koushik Bhattacharya’s music therapy led a group of his students who are settled in the US to invite him to conduct classes there. The first session was held in Chicago in 1994. The workshops, attended by members of the Indian community as well as Americans of every hue, was such a hit that there were demands for an encore. Since then, every year for the past two decades, Bhattacharya has been touring the country with his Indian classical therapy, taking his ray of light to sufferers from Los Angeles in the west to New York in the east, Chicago being a constant. Bhattacharya isn’t sure what his ancestors, purists in the classical tradition, would make of his using ragas as therapy, but he firmly vouches for its life-giving potential. Bhattacharya’s sojourns in the US usually take place during September-October, when he spends one-and-a-half to two months touring. Each class accommodates between seven and ten pupils, who are selected on the basis of online or direct applications and are grouped according to their level of advancement and training in classical music. “The therapy works best when the rendition is perfected,: Bhattacharya says. The sessions, which are charged at $25 a sitting, are so in demand that Bhattacharya has now had to take recourse to online video conferencing and Skype to meet it. Bhattacharya is not sure what his anc­estors, purists in the Hindustani classical music tradition, would make of his using ragas for therapy. Hailing from an old Andul family, his great grandfather was Premik Maharaj, a devotee of Kali and an exponent of the renowned Kali Kirtan tradition of Andul. 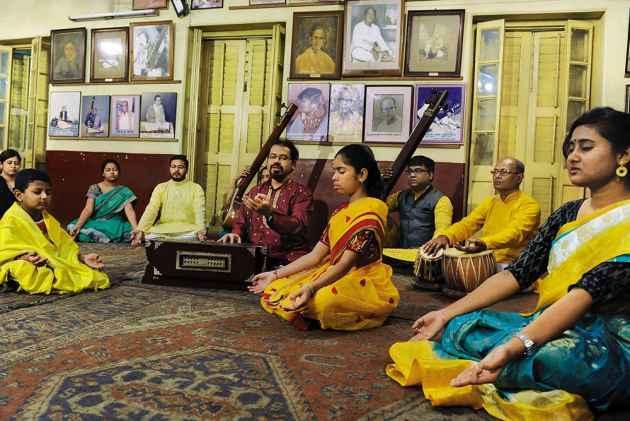 “Though it is called ‘kirtan’ or devotional songs, this tradition was actually rendered in the classical form of ‘dhrupad’,” explains Roma Devi, Bhattacharya’s mother, 75, who is a storehouse of knowledge about the family’s legacy and heritage. One of the most famous of all ‘Shyama sangeets’ (songs devoted to goddess Kali) of all time, Hridi-komoley boro dhoom legechhey, (God is tugging at the lotus of the heart) was composed by Bhattacharya’s great grandfather. His trained voice was much in demand during musical programmes not just in royal courts, but in temples too. In fact, the Bhattacharya household has the distinction of having hosted Swami Vivekana­NDA, who had dropped in to invite Premik Maharaj for a musical evening in Belur Math on the behest of the great mystic saint, Sri Ramakrishna Paramhansa. “It is a matter of great pride for our family that Sarada Ma (Ramakrishna’s wife) had even cooked for my great grandfather,” smiles Bhattacharya. His grandfather, Pandit Manindra Kumar, was a celebrated classical musician too, and was amongst the chief court musicians at the Andul Rajbari. A stone’s throw from the Bhattacharya household, Koushik still visits the crumbling ruins of the royal palace at night to try to catch the rumoured, spectral “sounds of anklets” which are supposed to issue from within the ‘naach ghar’ or dancing hall—now a large, derelict space trapped by the echoing corridors. “But I have never heard anything. Only the sound of my own tanpura,” he chuckles, explaining that sometimes he likes to sit on the wide open veranda in front of the palace, with its tall, peeling pillars and practise his ragas. Bhattacharya’s father belonged to the Kirana Gharana, but received guidance from several other greats, including Ustad Amir Khan. After his father’s death, Bhattacharya, who lives with his mother, wife and two sons, has taken on the mantle. But he says that he has evolved his own theory of music. “For the classicists of olden times, purists who consider the arts only exist for its own sake, it may be a difficult concept to grasp initially, but I feel that the fullest potential of this delightful and ancient musical system should be tapped into and we can only do that if we use its therapeutic value,” says Bhattacharya, making comparisons with the healing quality of yoga and herbal medicinal plants. As a pioneer of his own field, with the tools of his trade harking back to Vedic times, his declaration sounds as sonorous as a pure note.